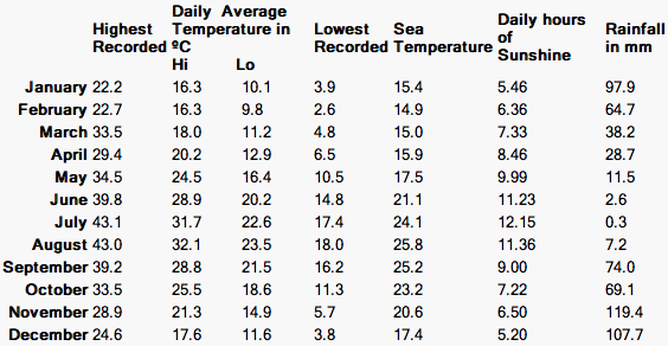 In Brief: Mediterranean; Mild, rainy winters; Hot, dry summers. Malta is a democratic country and the Nationalist Party (PN) is currently in government. Malta's electorate is finely divided between PN supporters and the opposition known as the Malta Labour Party (MLP). Elections are held every five years. 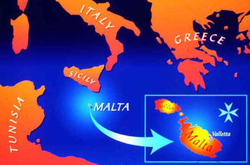 Malta has become a full member of the European Union on May 1st, 2004. Film insurers have always regarded the country as politically very stable. The cost of 20 per packet is about 3.50 Euros, USD$4.50, £2.50. Most international brands can be found in Malta. As of April 1st 2004 smoking will be banned from many public places which do not have designated smoking areas. The total population of the Maltese islands is around 385,000 habitants. Malta's habitants alone total approximately 350,000. Comino has only four habitants with the exception of hotel staff and guests. The greatest speciality is the Roundabout. The vehicle already engaged at the Roundabout has priority. However, most Maltese people ignore road regulations. So be careful - accidents are very frequent in Malta! Should you be unfortunate to have an accident, do not move the car before the police arrive. Insurance companies may not be very co-operative should you do otherwise. Overseas calls may be made to all parts of the world. The dialing code for outgoing overseas calls from Malta is "00" followed by the countries' code. Malta's international code is "356". The two mobile phone systems utilise a GSM network. Malta has international roaming agreements with many European countries for the use of GSM technology phones. In Malta, one can easily find cars of all ages in various conditions coming mainly from Britain, France, Japan and Korea. The American car model Ford also exists in great abundance. The typically larger American cars are however not available on the island (except from collectors) and drivers would have some difficulty getting them through certain narrow streets or tight corners which are so characteristic of the Maltese islands. Trucks of 40ft in length are not commercially viable on the island. Interesting to note are the old yellow public buses, many of which are still functioning - and running. Trains and subways do not exist in Malta.